Behlmann’s Carnection is the Premier Used Car Dealership in St. Peters. It is a product of a vision shared by Paul Behlmann and his son Roger. Paul was born the youngest of twelve children in a family who described themselves as “dirt farmers” in Florissant MO. He set out with two relatives to start a used tire sales business in north St. Louis County. Over the years, the company rapidly grew in to one of the largest tire and lawnmower retailers in the Midwest. In the 70’s General Motors asked Paul and his partners if they had any interest in acquiring the local GM dealership. The tire center became the first of the family’s auto dealerships. After years of success, in the year 2000, the Behlmann’s opened a dealership in St. Peters, which was the largest pre-owned center in the St. Louis metropolitan area. Nine years later, the family divided the automotive group, and a new full service facility was built. This is what we now know as Behlmann’s Carnection. Here we stand today with a well trained staff and the most diverse pre-owned inventory in the area. We offer one stop shopping with a friendly, no pressure atmosphere. 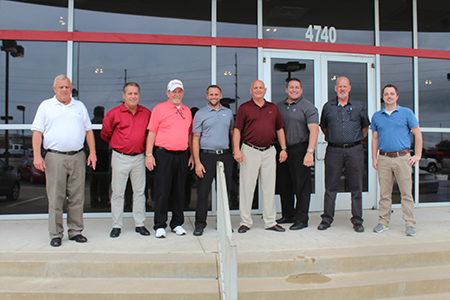 No funny business here, just years of dedication and hard work to produce the nicest used car dealership in St. Charles County. So, if you’re looking for a new-to-you vehicle in the Midwest area give us a look! We have a huge network of loyal clients and would love the opportunity to add you to our family! Don’t pay the MAX, because we are your Carnection!